Oba Ewuare (also Ewuare the Great) was the king of the Benin Empire from 1440 until 1473. 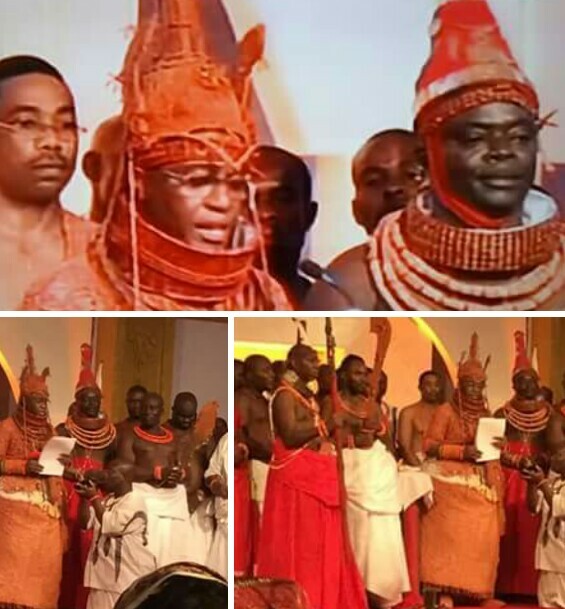 Ewuare became king in a violent coup against his brother Uwaifiokun which destroyed much of Benin City . After the war, Ewuare rebuilt much of the city of Benin, reformed political structures in the kingdom, greatly expanded the territory of the kingdom, and fostered the arts and festivals. He left a significant legacy and is often considered the first King of the Benin Empire. The rise of Ewuare to a position of power is chronicled by various different oral folktales and his lineage and specifics of his rise are disputed. The general tale starts with Ewuare being born as the eldest son to Ohen. At this point, Ewuare was known by the name Prince Ogun. A controversy arose upon the death of Ohun when the uzama appointed his younger brother Uwaifaikon as the Oba and exiled Prince Ogun. Ogun then traveled widely throughout the region during his exile vising many different kingdoms. A.F.C. Ryder contends that it is possible that Ewuare was an outside military leader and that the lineage story was created to establish legitimacy of his rule. Local historian Jacob Egharevba, in contrast, says that after the death of Orobiru, both Ogun and Uwaifaikon were banished from the city, but then Uwaifaikon was able to return, lied to the uzama, and was named king. One popular oral history contends that while Prince Ogun was exiled he performed a favor for a jungle spirit and as a result got a magic bag, called Agbavboko. Agbavboko had the magical qualities that no matter what Ogun put into the bag, it had more space and whenever he reached in he could pull out whatever he desired. During his travels, he gathered significant magical and herbal knowledge from a variety of sources. At one point, he felt the need to sleep under the sacred uloko tree and the tree told him to return to Benin City and reclaim the throne. On his way back to the city, he removed an infected thorn from a lion’s paw and the lion gave him a magic Talisman which he could use to create any situation in the world he desired. He arrived in Benin City surprised to find a parade for his brother Uwaifaikon while the people were in destitute circumstances. Prince Ogun used the talisman to set large parts of the city on fire. He then reached into Agbavboko and pulled out a bow with a poison arrow which he then used to assassinate Uwaifaikon. In the confusion that ensued, he hid with a slave, named Edo, that had taken care of him when he was young and who recognized him immediately in the chaos. Supporters of Uwaifaikon entered Edo’s house and killed him trying to find Ohun who had hidden. Ogun then exited the house and gathered his supporters and was able to assert his right to the throne. In Egharevba’s version, during a visit to the city during his exile, Ogun was taken in by a prominent chief who hid him in a dried well but then went to tell the authorities. The head slave of the chief, named Edo, let down a ladder into the well and advised Ewuare to escape. Ogun then took the name Ewuare meaning “the trouble has ceased”. Eventually, the honorific Ogidigan (the Great) was appended and he is often known as Ewuare Ogidigan or Ewuare the Great. The date for his rise to the throne is not precisely clear but is usually dated to 1440. To honor the slave that had sacrificed his life to save his, Ewuare also renamed the city to Edo (now Benin City).